We analyze the quantum mechanical equivalence of the metrics of a centrally symmetric uncharged gravitational field. 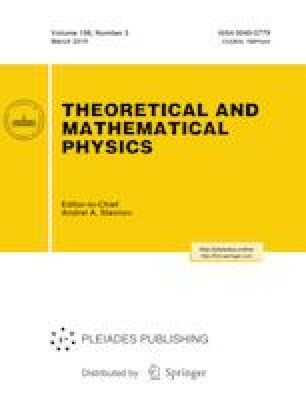 We consider the static Schwarzschild metric in spherical and isotropic coordinates, stationary Eddington–Finkelstein and Painlevé–Gullstrand metrics, and nonstationary Lemaˆıtre–Finkelstein and Kruskal–Szekeres metrics. When the real radial functions of the Dirac equation and of the second-order equation in the Schwarzschild field are used, the domain of wave functions is restricted to the range r > r0, where r0 is the radius of the event horizon. A corresponding constraint also exists in other coordinates for all considered metrics. For the considered metrics, the second-order equations admit the existence of degenerate stationary bound states of fermions with zero energy. As a result, we prove that physically meaningful results for a quantum mechanical description of a particle interaction with a gravitational field are independent of the choice of a solution for the centrally symmetric static gravitational field used. Translated from Teoreticheskaya i Matematicheskaya Fizika, Vol. 198, No. 3, pp. 489–522, March, 2019.